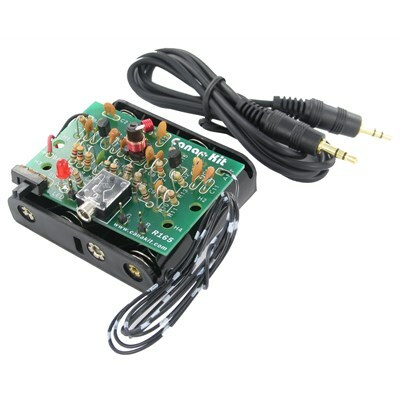 This mono FM transmitter is specially designed to be connected directly to the headphone output of your iPod, iPhone or other portable media player with a headphone jack. It incorporates a stereo input circuit that mixes the left and right stereo channels into a single mono signal. The input is equipped with inductors that will match completely with the headphone output and therefore prevents any possible interference noise. The transmitter is easily tunable to the entire FM commercial band (88 to 108 MHz) using an adjustable coil and is stable in frequency. An On/Off switch and LED indicator are also incorporated right on the board. A battery holder is included, as well as a stereo plug that makes it very easy to connect to your audio source.